Location: East-facing exterior wall of Transition Place at 10010-105 St.
Winning an Award of Excellence by the Edmonton Urban Design Awards (2011) and a Medal in the National Urban Design Awards (2012) by the Royal Architectural Institute of Canada, the ESPA proves that doodling can communicate very important messages. Designed by fellow zinesters, Holinaty and Ramsey, and created by a team of 14 artists, Transition reflects the ESPA’s advocacy towards an ideal and sustainable Edmonton. The Edmonton Small Press Association was founded in 1998 as a non-profit activist-arts society with a socially-conscious mandate, advocating small press initiatives as viable artistic expressions and valuable tools for positive social change. The ESPA is a resource network for independent producers, fostering the “D.I.Y or Die” (do-it-yourself) philosophy and our mottos are “People before Profits, Collaboration before Competition” and “Become the Media”. Working under a community cultural development disposition, ESPA activities encourage the development and dissemination of small press ventures by offering access to tech equipment, exhibits, archives, design support and other resources. Biographies: Luke Ramsey co-founded the Islands Fold residency on the Sunshine Coast, B.C. Ramsey exhibits internationally and works as a freelance illustrator. His client list includes: The New York Times, The Drake Hotel, MEC and Patagonia. 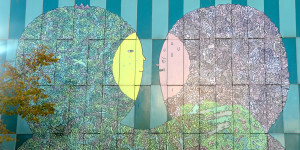 Luke’s practice includes collaboration, design, public art projects and detailed free-hand drawing. Luke’s first hand-drawn book IS? (Intelligent Sentient?) seems like an artifact from another time. Beautiful, detailed, filigreed drawings fold in on themselves and blossom out at the reader as time speeds up and contracts. A loose story is told that involves a society of giant people, strange art and inexplicable scientific experiments utilizing non-existent technology. Factories and tree houses teem with life, and the city nestles up against a landscape filled with dinosaurs, apes and dragonflies living peacefully side-by-side.